The agreement reached by Congressional leaders and President Trump to reopen the government provides a new opportunity for all sides to get together and work out a solution that provides enhanced border security for our country while making sure important government services continue. As the February 15th deadline looms, I will continue to do all I can to encourage leaders of both parties to find a resolution to these issues. 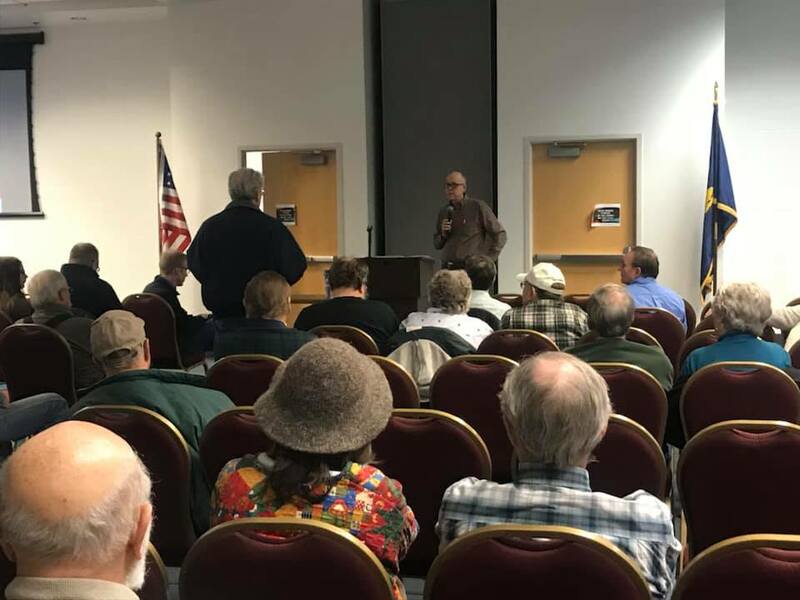 While the partial government shutdown continued, I used the time to hold town hall meetings in southern, central, and eastern Oregon from Friday, January 18 through Monday, January 21. During the four days, more than 1,700 Oregonians took time to share their concerns and questions in Grants Pass, Medford, Klamath Falls, Bend, Madras, Prineville, Burns and Ontario. These town halls — just like letters, emails, phone calls, individual meetings, and telephone town halls — help me update my “to-do” list to take back to Washington, D.C. During the last session of Congress, I responded to more than 168,000 phone calls, letters and emails. And since 2012, I’ve held 156 town hall meetings. I look forward to continuing these meetings in the coming weeks throughout the vast second district. After my town hall in Malheur County, I gave a quick recap regarding the topics discussed. Click here or on the image above to view my video. 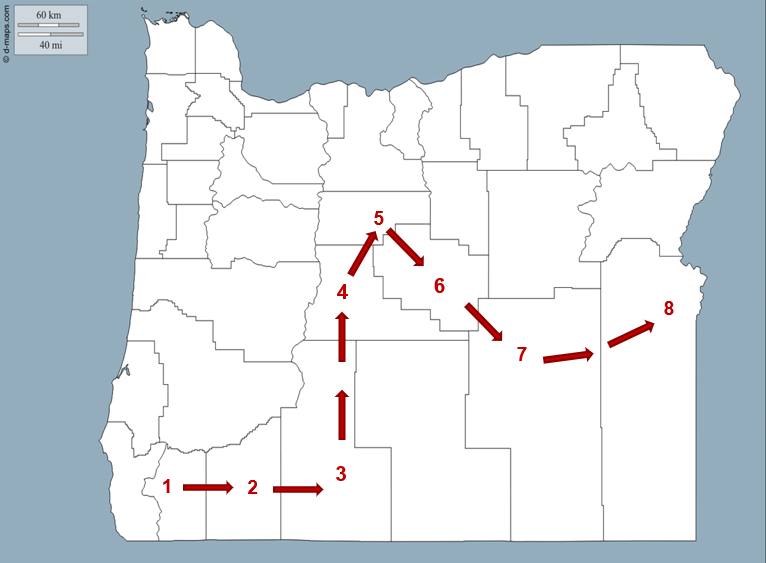 Travelling from one side of the state to the other, I held town hall meetings in eight counties across our vast district, from Josephine and Jackson to Harney and Malheur. I kicked off my series of town hall meetings in Josephine County at the Grants Pass High School Performing Arts Center. Much of our discussion focused on wildfires and smoke, which is no surprise since Grants Pass residents were inundated with wildfire smoke like much of southern Oregon this summer. In Congress, I worked hard to pass into law the most significant reforms to forest management in more than a decade. That includes a fix to the way we pay to fight wildfires starting in 2020, so that we are not robbing funds used for forest management to pay to fight fires. This will finally treat wildfires like the natural disasters that they are. But there is much more work to be done. During the town hall, one Grants Pass resident asked about the impact of wildfire smoke on our environment and health. According to the United States Forest Service and Environmental Protection Agency, the carbon emissions from wildfire smoke in Oregon in 2015 was the equivalent of 3 million cars and three-and-a-half coal fired plants. This makes it clear that the status quo of forest management needs to change. Following my town hall in Grants Pass, I headed to Medford, where residents raised similar concerns. I heard from a woman at my Medford town hall who told me how wildfire smoke is hurting the local economy. A real estate agent, she told me that some people are leaving southern Oregon, selling their homes, and vacant houses are left on the market because of the wildfire smoke. This economic impact is being felt across the region. Wildfire smoke cost the Oregon Shakespeare Festival in Ashland about $2 million in 2018. That was a result of more than 26 outdoor performances having to be canceled because of wildfire smoke. That’s more canceled shows than in all five previous seasons combined. We need to get to the root of this problem, including the way we tackle fires on federal land. In 2017, there were roughly the same amount of fire starts on federal lands and state lands in Oregon. 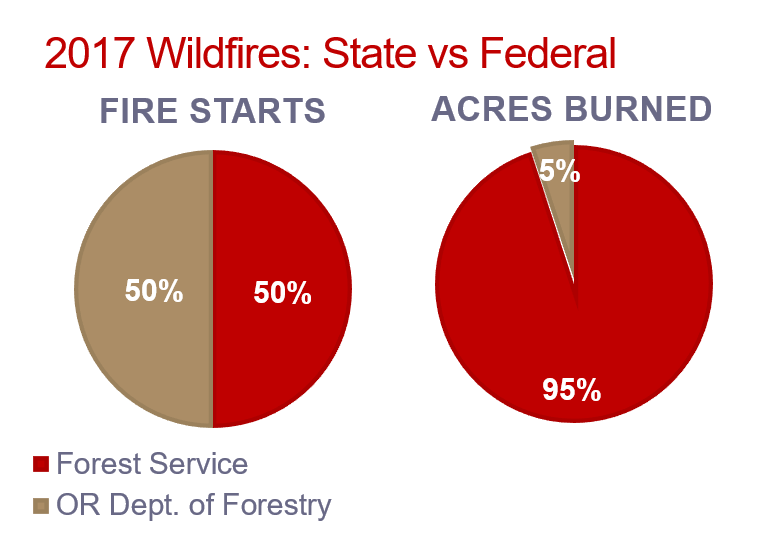 However, 95 percent of the acres burned from wildfires occurred on federal land managed by the Forest Service. During the town hall, I heard concerns about the response to wildfires that start on federal land, and that we need to be getting on these fires sooner to stop them from getting out of control. During hearings I held in Congress over the last two years, I told federal forest officials that they need to consider the health, environment, and economic impact of wildfire smoke when determining how to fight wildfires that start on federal land. 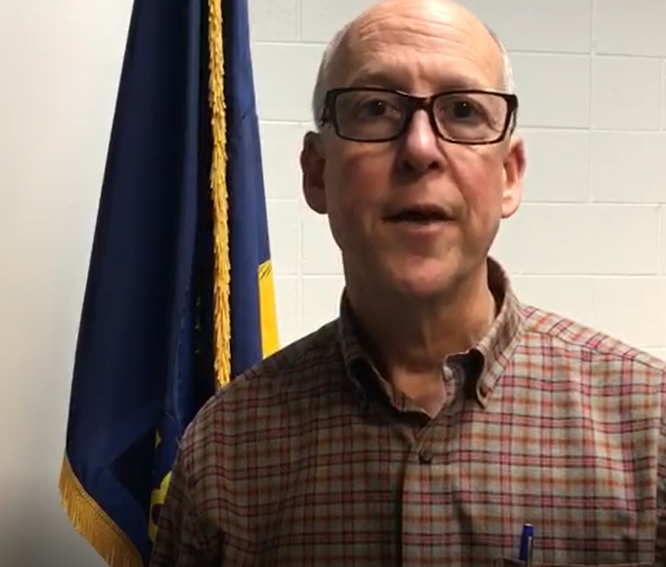 U.S. Rep. Greg Walden on Friday blasted the federal response to wildfires that have devastated the Southern Oregon economy, jeopardized local health and prompted an outcry from residents over what they believe is a “let-it-burn” philosophy. Click here to read more from the Medford Mail Tribune. From Medford, I headed to Klamath Falls for my third town hall meeting of the day. While some of the discussion again focused on improving forest management to prevent wildfires, as well as other national topics, we also talked about local issues like the water challenges facing the Klamath Basin. During the town hall, I heard about the fear farmers in the Basin have that severe drought conditions will continue to threaten their livelihoods. Addressing this issue is a top priority for me in Congress. Last Congress, I worked to secure needed drought relief measures for Klamath Basin irrigators to help them survive the water year in Oregon. Congress authorized $10 million annually for four years to the Bureau of Reclamation to implement needed drought relief measures for the $181 million agriculture economy in the Klamath Basin.That means that we will be better prepared if we have another challenging water year in the Basin in 2019 and subsequent years after that. As I said during the town hall meeting, I will continue to work closely with farmers, tribes and others in the Basin to ensure our agriculture community in Klamath Falls can thrive for generations to come. 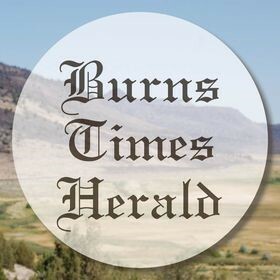 Click here to read more from the Klamath Falls Herald and News. 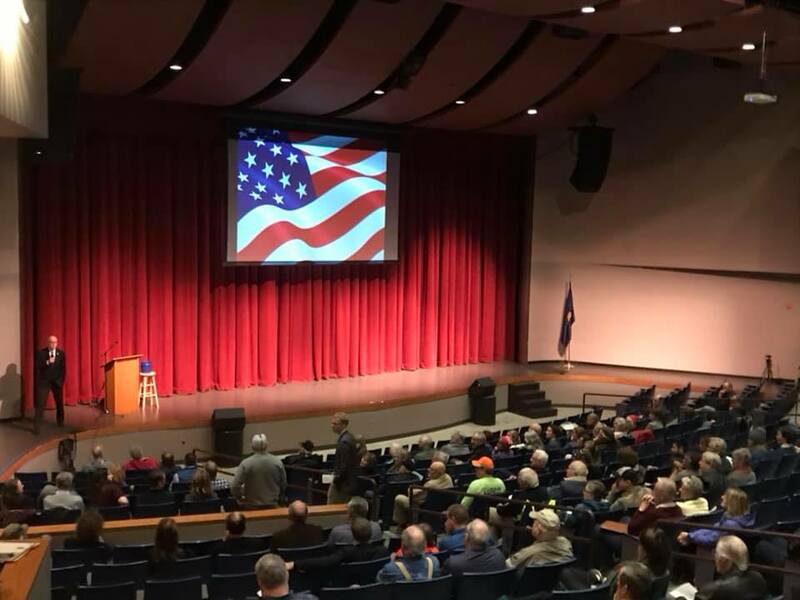 On Saturday afternoon, I held a town hall in Bend at Mountain View High School. One topic that was at the top-of-mind for participants during the town hall was climate change and boosting renewable energy. As we work to address this issue, I am committed to finding solutions that prioritize adaptation, conservation, and innovation. However, I believe we can do this without taxation, overregulation, and economic stagnation. Last Congress, I led the effort to pass into law legislation that would boost hydropower production across the country.Hydropower generates 40 percent of the electricity in Oregon and has great success as a renewable energy source in our state. The bill we passed into law will streamline the permitting process for adding hydropower generation to existing water infrastructure, so we can complete more projects like Central Oregon Irrigation District’s Juniper Ridge hydro project. This project turns piped irrigation water into enough power for 3,300 homes, while also conserving water for farmers and fish. We also streamlined permitting for closed-loop pumped hydropower projects. 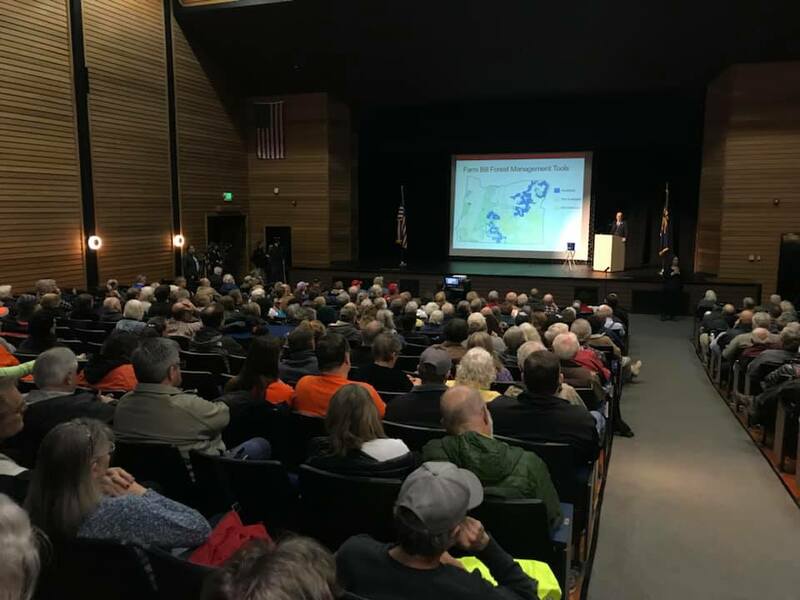 The Swan Lake Pumped Hydropower Project is in development near Klamath Falls, which aims to generate enough power for 600,000 homes. This is the kind of innovation we need to boost renewable energy and adapt America’s power portfolio in a way that benefits both our economy and environment. On Sunday, I kicked off the day with a town hall in Madras. 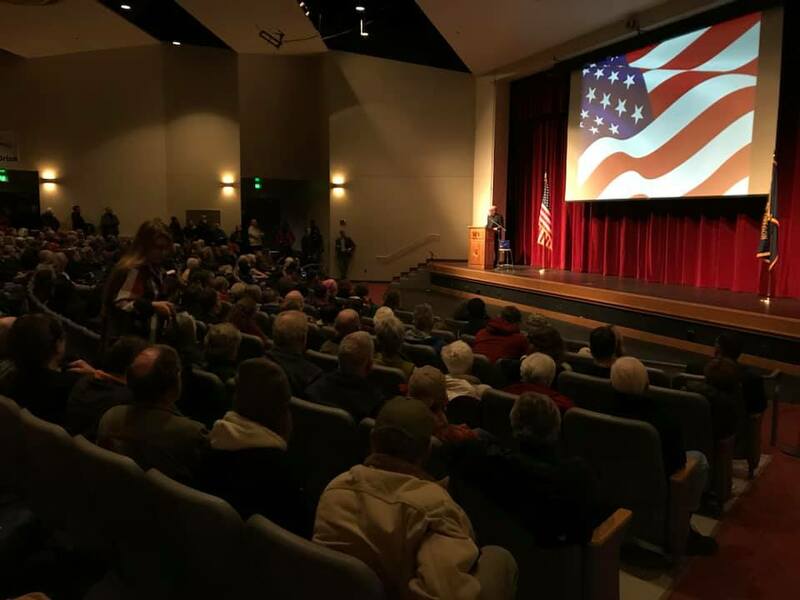 Before the town hall began, veterans with the Madras Veterans of Foreign Wars (VFW) Post 12141 completed the “Posting the Colors” ceremony, when the American flag and Oregon flag are posted at the front of the room, before we said the Pledge of Allegiance. The veterans with Madras VFW Post 12141, like all of the men and women who have worn our country’s uniform, are owed a debt of gratitude that can never be repaid. The least that we can do is ensure America’s veterans are receiving the care and support they deserve at the VA. During my town hall in Madras, I gave an update on my work in Congress to do just that. With my support, Congress passed historic funding for the Veterans Administration — more than $70 billion to help the VA improve care for our veterans. Importantly, this funding emphasizes boosting mental health care, opioid abuse prevention, and rural health care programs. This is the largest dollar amount ever for the agency. We also passed into law the VA MISSION Act, which bolsters the VA to boost care for our veterans. Importantly, this legislation includes my bill to introduce medical scribes into the VA system to handle paperwork and patient record keeping, so doctors can focus their full attention on their patients. This resulted in a 59% increase in the number of patients doctors can see per hour in the private sector, and we want to bring that success to our veterans at the VA.
I’ve helped more than 8,000 Oregon veterans and their families with problems at the VA. If you or a loved one needs help with the VA, or any other federal agency, please do not hesitate to reach out to my office at 800-533-3303. I will do everything I can to get results for you. 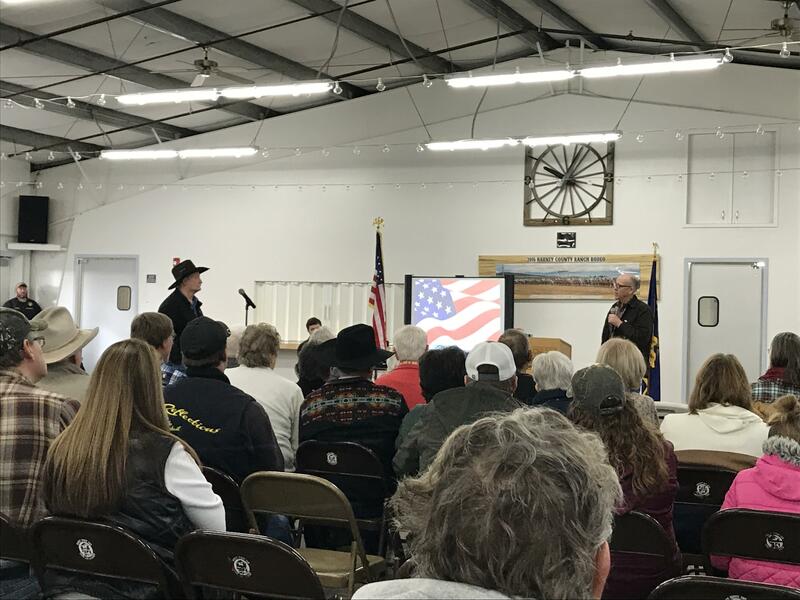 On Sunday afternoon, I headed over to Crook County for a town hall meeting in Prineville. 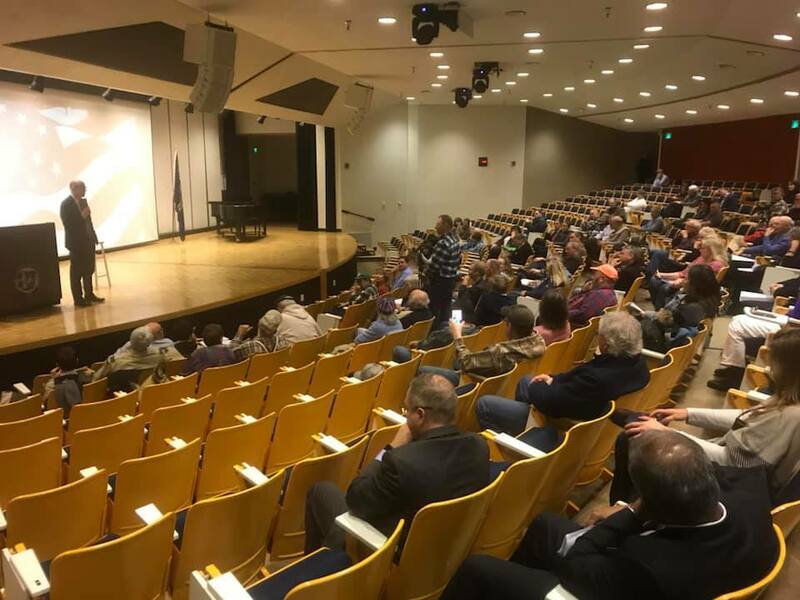 The main topic of concern was the partial government shutdown, which was still ongoing at the time of the town hall meeting. This concern was raised at every town I held, and is a concern that I hold as well. As I said during these town hall meetings, I have empathy for the federal workers, their families, contractors, and local businesses who were caught up in this. That’s why I requested that my pay be withheld during the partial shutdown. But also let me be clear: It’s essential to any country’s security to have meaningful border security. I support securing our border with barriers, technology, and additional personnel, and believe Congress should come together with the President to strengthen border security. We’ve consistently done so in a bipartisan manner in the past. At the same time, I do not agree that it makes sense to furlough the people working on the biological opinion in the Klamath Basin, or forest fuels reductions in southern Oregon, or grazing permits in eastern Oregon, or any of the other important projects federal agencies need to complete in our district. That’s why I voted repeatedly to open federal agencies like the Forest Service, BLM, and others that have nothing to do with the important debate over border security. I also voted repeatedly to immediately pay the federal workers impacted by the partial shutdown. I hope leaders in Congress can come to the negotiating table with the President to fund the government in the longterm and address the concerns I heard from Oregonians in Prineville and across our district. Click here to read more from the Central Oregonian. My view just east of Brothers as I traveled to Burns for town hall number 155 since 2012. On Martin Luther King Jr. Day, I continued my series of town halls with a meeting in Harney County. Martin Luther King Jr.’s life was a testament to peaceful, productive, and respectful civic discourse and engagement. The town hall meetings I held throughout southern, central, and eastern Oregon certainly honored this legacy. During my town hall meeting in Burns, I took the opportunity to talk about my efforts in Congress to expand internet access in our communities. More than 23 million Americans do not have adequate access to broadband services, including many people in eastern Oregon. That’s why I continue to lead efforts in Congress to bring broadband to rural America and connect our communities with the 21st Century economy. Last Congress, I helped pass into law the first modernization of the Federal Communications Commission (FCC) in more than two decades. This legislation that is now law is called the RAY BAUM’S Act, named after La Grande native, former state lawmaker, and my friend Ray Baum who tragically passed away from cancer last year. RAY BAUM’S Act will help boost the development of next-generation wireless broadband known as 5G, and improves FCC’s ability to expand broadband infrastructure in rural Oregon. Last year, I brought FCC Chairman Ajit Pai to eastern Oregon to learn more about the benefits of expanding broadband into our communities. Broadband can boost access to telehealth, improve precision agriculture, and help our first responders in an emergency. Bridging the digital divide will continue to be a top priority for me in Congress. U.S. 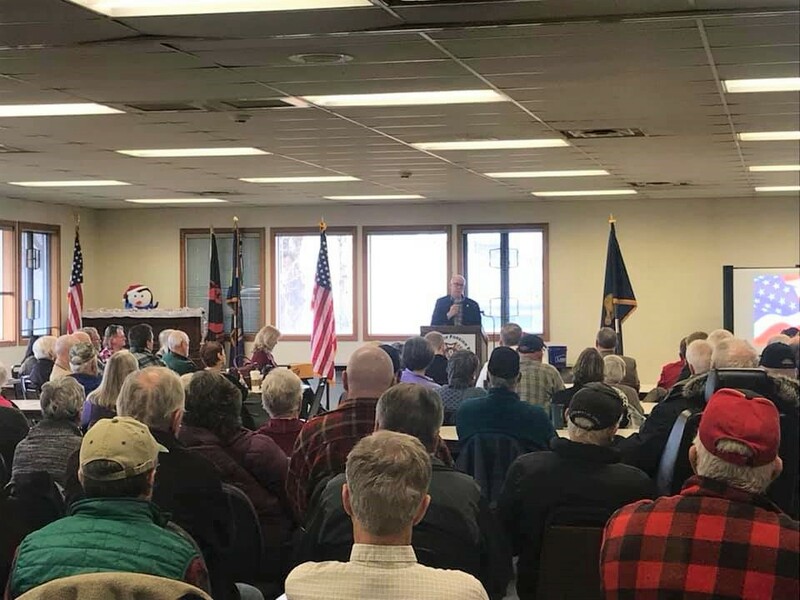 Congressman Greg Walden held a town hall meeting in Burns on Monday, Jan. 21, in which he recapped the issues he’s working on in Washington, D.C., and listened to concerns from residents…. … Walden talked about the need for bringing more broadband into rural areas, and the ever-increasing speed of digital service. 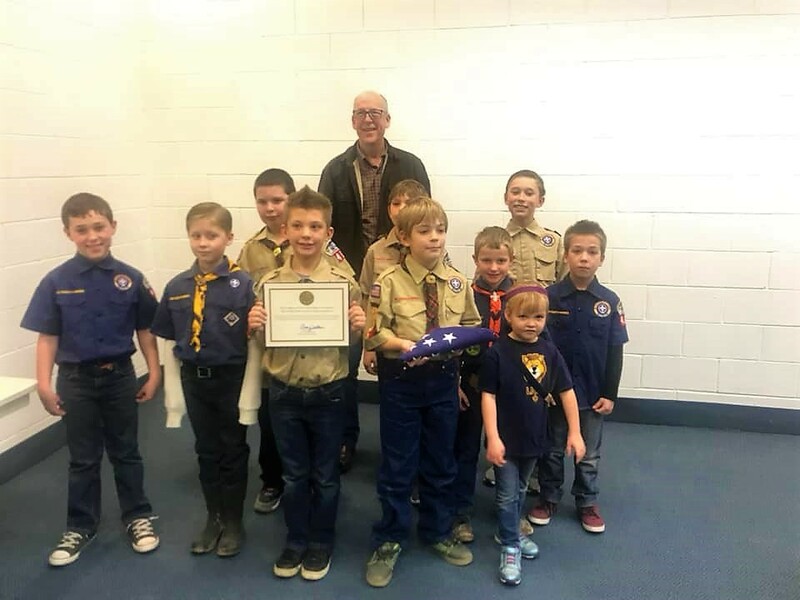 Following my town hall in Burns, the Cub Scouts of Pack 467 in Ontario welcomed me to Malheur County for my 156th town hall meeting since 2012. During the town hall meeting, I discussed how the majority of the work we do in Congress is bipartisan. Partisan legislative fights may receive the bulk of national media attention, but those fights are the exception, not the rule. The House Energy and Commerce Committee, where I served as Chairman, passed148 bills through the House of Representatives in the last Congress, 93 percent of which received bipartisan votes when they passed and 57 of which became law. That includes our landmark opioids package, which included more than 60 individual bills that passed the House by overwhelming bipartisan voters. A crucial piece in our efforts to combat the opioid crisis is the work of community health centers. There are 12 community health centers that serve more than 240,000 Oregonians at 63 delivery sites across our vast district. 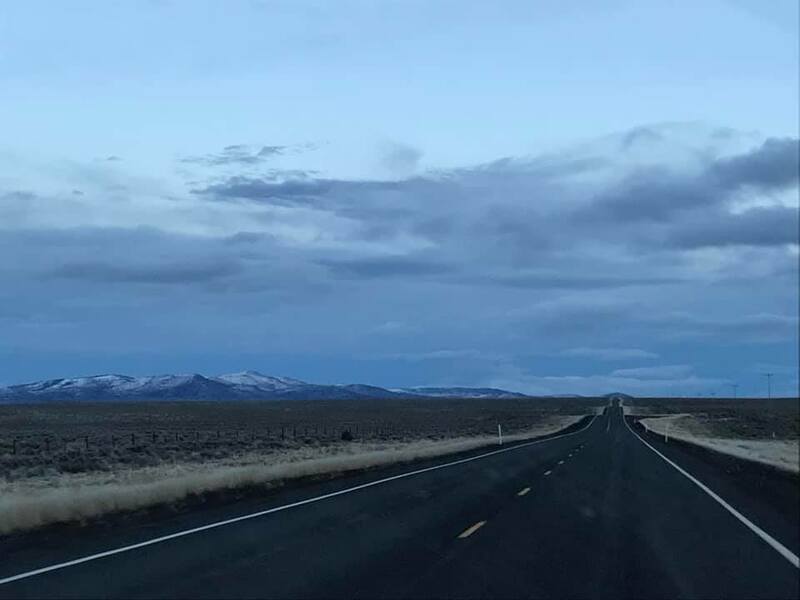 Community health centers like Valley Family Health Center in Malheur County provide vital health care services, like substance abuse treatment, to patients in rural and underserved communities. During the town hall meeting in Ontario, I presented Valley Family Health Center Executive Director Tim Heinze with a copy of legislation I passed into law to extend funding for community health centers. Last year, Tim gave me a tour of the community health center in Ontario and I saw firsthand the work of the Valley Family team to provide health care to our community. Under my leadership, we were able to get a two-year reauthorization of community health centers at the highest funding levels ever. This means that Tim and others can continue to care for the Oregonians who get care at community health centers. While I was originally scheduled to continue my series of town halls in eight more counties across our district, last minute scheduling changes in the House required that I return to Washington, D.C. for legislative business. Town halls originally scheduled for last week will be rescheduled for later dates and announced accordingly. I will be sure to keep you updated on the details for these upcoming meetings and hope to see you at a town hall in your community! Please feel free to sign up for my E-Newsletter, like me on Facebook, and follow me on Twitter and Instagram if you have not already done so. If you would like to contact me with a follow-up question or comment, you can do so by clicking here. Click here if you would like to Unsubscribe. *By subscribing to my e-mail updates, you are authorizing me to send regular e-mail updates from my office to your e-mail account.